You can create and add tracks to a playlist through our website and apps. Where would you like to create a playlist? Please note: Making the playlist public or private does not impact the privacy settings of the tracks within the playlist. However, public playlists will be pushed to your followers’ Streams, so make sure that the tracks within the playlist are also public and can be viewed by others. Additionally, there is not a way to add tracks to the top of a playlist. All new tracks will appear on the bottom of the playlist, which you can rearrange into a different order later. 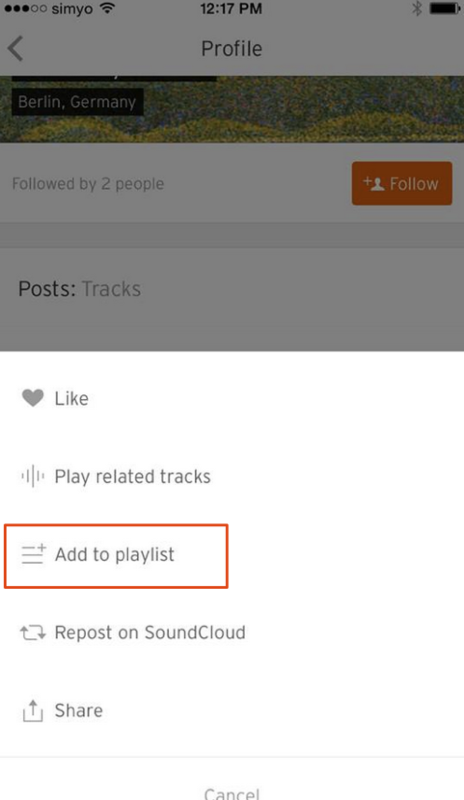 To add tracks to an existing playlist, click on ‘Add to playlist’ below any track to place it into a playlist. To create a new playlist, click the 'Create New' playlist tab. When creating a new playlist you can decide on a title, and if you want the playlist to be public, or private. We also recommend limiting the number of tracks in your playlist to a maximum of 250 for it to easily load. On the 'Now Playing' screen (the screen that comes up when a track is playing), you'll see in the bottom left-hand corner three dots that indicate the 'More' button. Tap this and then tap ‘Add to playlist’. 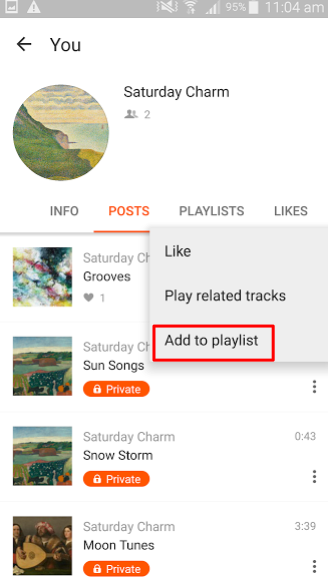 You’ll be prompted to either choose a playlist to add the track to, or you can create a new playlist by tapping the plus sign in the upper right-hand corner. Please be aware that playlists created in the app will automatically be set to private. These can easily be set to public on the app by going to the playlist’s page, and tapping the three dots on the right under the playlist cover image. From the menu, you can select 'Make playlist public’. On the 'Now Playing' screen (the screen that comes up when a track is playing), you'll see in the bottom right-hand corner three dots that indicate the 'More' button. Tap this and then tap ‘Add to playlist’. You’ll be prompted to either choose a playlist to add the track to, or you can create a new playlist by tapping the plus sign in the upper right-hand corner. From there, you can choose a title for the playlist and whether or not you would like it to be private or public.